N51 = our large table, 32″ x 48″ play area. N = NO HOLES in framing (see our N99 Slide Hammer ‘N Nails under Accessories to understand the uses of our holes in framing. Also N95 Nails, Fiddlestix, N70 Nilo-Jax, N90 Rok-Jax. X = Something is not included with purchase. 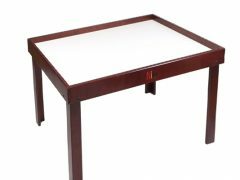 In the case of N51 series tables this means the N65 Graphic Play Mat is not included. With N34 series it means the Block Mats are not included.